Anthony Gerard Foley (30 October 1973 – 16 October 2016) was an Irish rugby union player and head coach of Munster. He was attached to the same squad during his professional playing career. He was a member of the Munster team that won the 2002–03 Celtic League and was the winning captain during their 2005–06 Heineken Cup success. Foley played for Ireland from 1995 until 2005 and captained the squad on three separate occasions. In March 1989, Foley led St. Munchin's College to victory in the Munster Schools Junior Cup. He later represented Munster and Ireland Schools on several occasions over two seasons, notably during the 1992 Irish Schools tour of New Zealand. Winning six games out of eight, Ireland narrowly lost the final game to a New Zealand side featuring Jonah Lomu at number 8. A controversial Jeff Wilson penalty-goal won the game in the final minutes. Foley made his professional debut for Munster against Swansea in November 1995, a game that was also Munster's first ever Heineken Cup fixture. He was in the Munster team that lost 8–9 to Northampton Saints in the 2000 Heineken Cup Final, and was again the runner-up when Munster lost 15–9 to Leicester Tigers in the 2002 Heineken Cup Final. Foley was finally on the winning side when Munster won the 2002–03 Celtic League. When Mick Galwey resigned as Munster captain, Foley narrowly lost to Jim Williams in a vote to decide the next captain. When Williams left Munster in 2005, Foley became the new captain, and in his first season in the position, he led Munster to victory over Biarritz Olympique in the 2006 Heineken Cup Final. Foley had played in all but one of Munster's first 78 Heineken Cup games until a shoulder injury sustained during Munster's 21–19 victory over Leicester Tigers at Welford Road in their first game of the 2006–07 Heineken Cup caused him to miss his sides subsequent victory over Bourgoin, as well as back-to-back games against Cardiff in December 2006. He stood down as captain at the beginning of the 2007–08 season, making way for Paul O'Connell. He was dropped for Munster's final fixtures of the 2007–08 Heineken Cup, and announced his retirement for the end of the season. Foley made his debut for Ireland against England in the 1995 Five Nations Championship on 21 January 1995. He scored a try on his debut in an 8-20 defeat. He went to the 1995 Rugby World Cup in South Africa, and played as a replacement in one pool game against Japan which Ireland won 50-28. He missed the 1999 Rugby World Cup, but was selected for the 2003 Rugby World Cup, featuring in two of the pool games against Romania and Australia. Foley captained Ireland three times: in 2001 against Samoa, and in 2002 against Romania and Georgia. His last international was against Wales in the 2005 Six Nations. 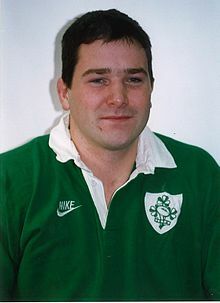 In total Foley played in 62 matches for Ireland and scored 5 tries against England in 1995, Romania in 2001, Fiji in 2002, France in 2004, and Wales in 2004. In March 2011, it was announced that Foley would take over as Munster forwards coach at the end of the 2011 season. He temporarily replaced Gert Smal as Ireland's forwards coach during the 2012 Six Nations Championship, after Smal was forced to miss the remainder of the tournament with an eye condition. Foley signed a contract extension with Munster in May 2013. The following year it was announced that Foley would succeed Rob Penney as Munster's head coach, signing a two-year contract that began on 1 July 2014. He was married to Olive; the couple had two children. His father Brendan Foley and sister Rosie Foley [fr] also played rugby for Ireland. Foley played Gaelic football for his local GAA club Smith O'Briens in the parish of Killaloe, County Clare. He lined out for Smith O'Briens GAA club in a Munster junior club football semi-final in 2010. He played inter-county hurling for Clare at underage level alongside former Munster rugby player Keith Wood. Foley was nicknamed 'Axel', after the Beverley Hills Cop character. Foley died in his sleep on 16 October 2016, while staying at a hotel in the Paris suburb of Suresnes with the Munster squad; heart disease had caused an acute pulmonary oedema. The team was preparing to face Racing 92 in its opening game of the 2016–17 European Rugby Champions Cup. The match was postponed as a result of Foley's death. President Michael D. Higgins and then-Taoiseach Enda Kenny made tributes to Foley, and the Irish flag flew at half mast at government buildings in Munster. Foley was brought home to Ireland on Wednesday 19 October 2016. His funeral took place on Friday 21 October 2016 at St Flannan's Church in Killaloe, County Clare. On 22 October 2016, in the first game after Foley's death, Munster beat Glasgow 38–17 at a sold-out Thomond Park. Tributes were paid to Foley before, during and after the game and the number 8 jersey was retired for the game, with CJ Stander wearing the number 24 for the occasion. Before their historic first ever win against New Zealand in Soldier Field, Chicago on 5 November 2016, the senior Irish men's team paid tribute to Foley by forming a figure of 8, led by Munster's CJ Stander, Simon Zebo, Conor Murray and Donnacha Ryan, to face the All Blacks Haka. Ahead of a game against Munster on 11 November 2016, the Māori All Blacks team paid tribute to Foley by placing a jersey with his initials on the halfway line before performing a Haka. Māori captain Ash Dixon then presented the jersey to Foley's sons. Munster went on to win the historic game 27–14. On 7 January 2017, further tributes were paid to Foley when the rescheduled Round 1 fixture between Racing 92 and Munster took place. To honour Foley's memory and contribution to European rugby, the EPCR announced that the 2016–17 European Player of the Year would receive the Anthony Foley Memorial Trophy. The trophy was commissioned with the agreement of the Foley family and Munster Rugby and it is envisaged that it will be presented to all future European Player of the Year winners. In June 2017, a monument to Foley was unveiled in Limerick. In September 2017, Foley was posthumously awarded the Richard Harris Patrons' Award at the annual Munster Rugby London Dinner. The award recognises an individual who encapsulated the values of Munster and was presented to Foley's parents. Over €39,000 in proceeds from the special commemorative programme sold for Munster's match against Glasgow Warriors on 22 October 2016 was raised and donated to various good causes. He was posthumously inducted into the Munster hall of fame during the 2018 Munster Rugby Awards. ^ a b "Irlande: décès soudain d'Anthony Foley, le monde du rugby sous le choc" [Ireland: Sudden death of Anthony Foley, rugby world in shock]. La Dépêche (in French). AFP. 16 October 2016. Retrieved 17 October 2016. ^ "Munster Rugby 17–13 Swansea". munsterrugby.ie. 1 November 1995. Archived from the original on 14 September 2012. Retrieved 29 November 2011. ^ "Tony Ward: Let there be no doubt about it - this modest man was a legend of both Munster and Irish rugby". Irish Independent. 17 October 2016. Retrieved 17 October 2016. ^ "Munster Rugby 8–9 Northampton Saints". munsterrugby.ie. 27 May 2000. Archived from the original on 25 August 2013. Retrieved 29 November 2011. ^ "Leicester Tigers 15–9 Munster Rugby". munsterrugby.ie. 25 May 2002. Archived from the original on 25 August 2013. Retrieved 29 November 2011. ^ "Munster Rugby 37–17 Neath". munsterrugby.ie. 1 February 2003. Archived from the original on 25 August 2013. Retrieved 29 November 2011. ^ Thornley, Gerry (10 August 2002). "Williams chosen to lead Munster". The Irish Times. Retrieved 16 October 2016. ^ "Biarritz Olympique Pays Basque 19–23 Munster Rugby". munsterrugby.ie. 20 May 2006. Archived from the original on 23 October 2013. Retrieved 29 November 2011. ^ "Injured Foley out for two months". BBC Sport. 25 October 2006. Retrieved 16 October 2016. ^ "Foley reveals retirement plans". RTE Sport. 21 January 2008. Retrieved 14 March 2011. ^ "End of an Era". munsterrugby.ie. 7 May 2008. Archived from the original on 18 November 2011. Retrieved 29 November 2011. ^ "Ireland 8–20 England". espnscrum.com. 21 January 1995. Retrieved 29 November 2011. ^ "Ireland 50–28 Japan". espnscrum.com. 31 May 1995. Retrieved 29 November 2011. ^ "Anthony Foley, Munster head coach and former Ireland back-row, dies aged 42". The Guardian. 16 October 2016. Retrieved 16 October 2016. ^ a b "Anthony Foley: A rugby career". RTÉ. Retrieved 16 October 2016. ^ "Shock and disbelief as rugby world mourns passing of legend Anthony Foley". Irish Examiner. 17 October 2016. Retrieved 17 October 2016. ^ "Ireland Career". ESPN. 19 October 2016. Retrieved 19 October 2016. ^ "New role for Foley with Munster". RTE Sport. 14 March 2011. Retrieved 14 March 2011. ^ "Foley Temporary Replacement For Smal". munsterrugby.ie. 24 February 2012. Archived from the original on 6 September 2012. Retrieved 24 February 2012. ^ "Gert Smal Update". irishrugby.ie. 24 February 2012. Archived from the original on 8 September 2012. Retrieved 24 February 2012. ^ "Foley And Costello Extend Their Contracts". munsterrugby.ie. 17 May 2013. Archived from the original on 25 December 2013. Retrieved 17 May 2013. ^ "Confirmed: Johan 'Rassie' Erasmus is the new Munster Director of Rugby". The 42. 25 April 2016. Retrieved 19 October 2016. ^ "Foley Confirmed As Next Head Coach". munsterrugby.ie. 19 February 2014. Archived from the original on 22 February 2014. Retrieved 19 February 2014. ^ a b "Anthony Foley: Munster rugby coach dies suddenly in Paris". BBC Sport. 16 October 2016. Retrieved 16 October 2016. ^ "Ireland rugby hero Wood to whip Smith O'Brien's into shape". ^ "Smith O'Brien's Inter-County Players". Archived from the original on 26 April 2012. ^ "Anthony Foley funeral details confirmed as autopsy results reveal cause of death". Irish Independent. 19 October 2016. Retrieved 19 October 2016. ^ Marlowe, Lara (18 October 2016). "Anthony Foley died of acute pulmonary oedema caused by heart disease". The Irish Times. Retrieved 19 October 2016. ^ "Statement On The Sudden Passing Of Anthony Foley". Munster Rugby. 16 October 2016. Retrieved 16 October 2016. ^ "President and Taoiseach lead tributes to sporting hero Foley". RTÉ. 16 October 2016. Retrieved 19 October 2016. ^ "Video: Mourners sing emotional rendition of 'There is an isle' in guard of honour for Anthony Foley's remains outside Thomond Park". independent.ie. 19 October 2016. Retrieved 6 November 2016. ^ "'Anthony will be with us in spirit, every step of the way' - Olive Foley pays emotional tribute to husband". independent.ie. 22 October 2016. Retrieved 6 November 2016. ^ "Munster Do Foley Proud With Immense Display". Munster Rugby. 22 October 2016. Retrieved 22 October 2016. ^ "Ireland Stun All Blacks To Create History In Chicago". Irish Rugby. 5 November 2016. Retrieved 6 November 2016. ^ "New Zealand Maori pay tribute to late Munster coach Anthony Foley". Stuff NZ. 12 November 2016. Retrieved 12 November 2016. ^ "Magnificent Munster Conquer Maoris". Munster Rugby. 11 November 2016. Retrieved 16 November 2016. ^ "Friend and former teammate Ronan O'Gara took part in Racing 92's tribute to Anthony Foley at the Stade Yves-Du-Manoir". Irish Independent. 7 January 2017. Retrieved 8 January 2017. ^ "The Anthony Foley Memorial Trophy". Munster Rugby. 13 May 2017. Retrieved 13 May 2017. ^ "WATCH: 'An outstanding tribute' - Monument to Anthony 'Axel' Foley unveiled in Limerick". Irish Independent. 21 June 2017. Retrieved 21 June 2017. ^ "Anthony Foley Honoured With Richard Harris Patrons' Award". Munster Rugby. 21 September 2017. Retrieved 21 September 2017. ^ "Over €39K Raised From Foley Programme". Munster Rugby. 3 October 2017. Retrieved 3 October 2017. ^ "Earls Named Munster Player Of The Year". Munster Rugby. 25 April 2018. Retrieved 25 April 2018. ^ "Foley inducted into Hall of Fame as Earls is named Munster's Player of the Year". The 42. 25 April 2018. Retrieved 26 April 2018.